Our approach works! 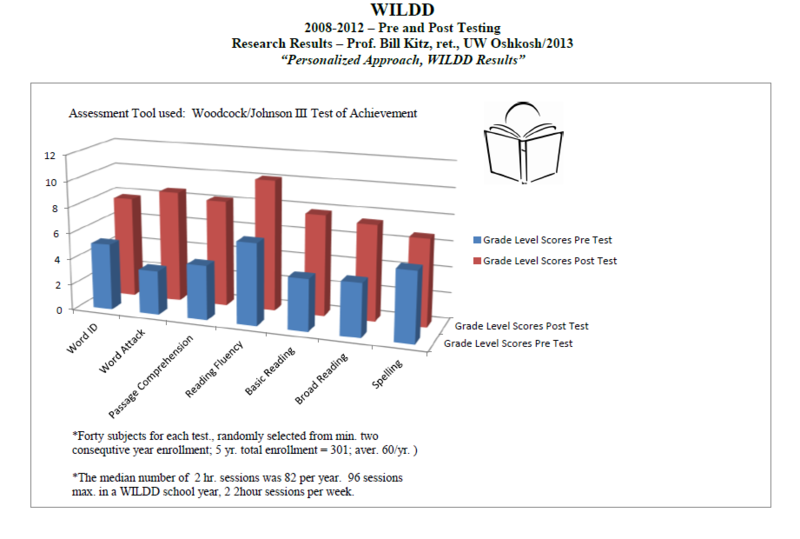 WILDD has a track record of raising reading by three grade levels in six months. The charts below illustrate our clients’ growth using the WILDD CLASS™ method of academic therapy. For additional information about our testing and results, please feel free to contact our Director of Research and Diagnostics, Kim Carpenter, at 608-824-8980. Please visit our Testimonials page to hear, first hand, from some of our clients. 1Data derived from 2012 results. 2Growth measures the improvement, in terms of equivalent grade level, of the associated skill. Comprehension 4 A measurement of the client’s ability to understand what he or she reads. Fluency 3.8 A measurement of the ability to read sentences smoothly and quickly while understanding them as expressions of complete ideas. Spelling 1.3 A measurement of the ability to write orally-presented words with accuracy. Encoding is another word for spelling. Decoding/Phonics 5.2 A measurement of the ability to analyze an unfamiliar word and pronounce it correctly using specific rules. Decoding is using phonetic rules to read unfamiliar words. Broad Reading 3.2 An overall measurement of a client’s ability to read based on their performance in decoding, fluency and comprehension. 1This quantifies the effectiveness of a particular intervention. 2Effect Size of 1 to 0.3 is a small effect, 0.3 up to 0.5 is a medium effect and 0.5 and above is a large effect.